DOCUMENTS, GOVERNMENT PRINTING OFFICE, WASHINGTON 25, D. C.
LeBovit and Faith Clark. Agricultural Reserch Service. 90 p., illus. (AB 146.) FOR SALE ONLY. home economies, and utilization of agricultural products. Price $1.00. FOR SALE ONLY. tural Research Service. 20 p., illus. (C 981.) Price 15t. the processing plant in lugs or by the water method are given. Merchandising natural cheddar cheese in retail food stores. Hugh M.
Marketing Service. 11 p., illus. (MRR 115.) Price 10f. FOR SALE ONLY. ing Service. 68 p., illus. (MRR 116.) Price 40?. FOR SALE ONLY. Marketing Service. 9 p., illus. (MRR 117.) Price 10?. FOR SALE ONLY. servation Service. Folder, illus. (M 714.) Price 5;. coming student trainees in soil and water conservation work. illus. (M 716.) Price 5;. 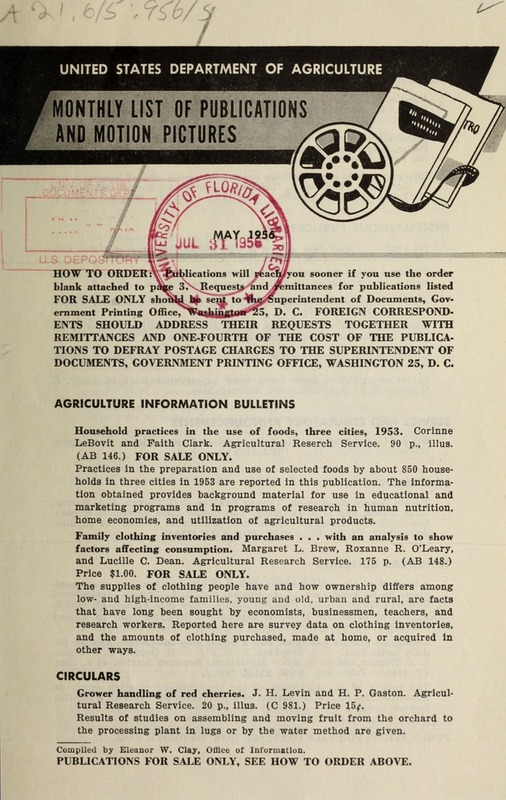 U. S. Department of Agriculture are described in this folder. illus. (M 717.) Price 5;. Career opportunities in soil and water conservation work in the U. S.
Department of Agriculture are outlined here. tion with the Mississippi Agricultural Experiment Station. 86 p., illus. Series 1942, No. 14. Price $2.50. FOR SALE ONLY. Research Service. 73 p., illus. (T 1141.) Price 30;. FOR SALE ONLY. R. E. Wagner, and M. A. Hein. Agricultural Research Service. 44 p., illus. (T 1144.) Price 20;. FOR SALE ONLY. Service. 24 p., illus. (FAR 89.) Price 15g. FOR SALE ONLY. Agricultural Service. 119 p., illus., unnumbered. World import duties on United States dairy products. W. Bruce Silcox. year, domestic; $1.35 a year, foreign. FOR SALE ONLY. year, domestic; 70e a year, foreign. FOR SALE ONLY. varies depending on size. $3.00 a year, domestic; $4.00 a year, foreign. in price. $8.00 a year, domestic; $9.50 a year, foreign. FOR SALE ONLY. $1.00 a year, domestic; $1.50 a year, foreign. FOR SALE ONLY. a year, domestic; $2.00 a year, foreign. FOR SALE ONLY. YOUR ADDRESS SHOW YOUR OLD ADDRESS AS WELL AS THE NEW ONE. WITHIN THE UNITED STATES AND ON INTERNATIONAL EXCHANGE. domestic; $2.00 a year, foreign. FOR SALE ONLY. year, domestic; $1.75 a year, foreign. FOR SALE ONLY. concerned. They are both sound and silent and are released In 16-mm. mad 86-rm. widths. Films in the 16-mm. size are available from State film libraries; 85-ma. the District of Columbia, and the Territories of Alaska, Hawaii, and Pueto Rieo. GRASSHOPPERS CAN BE CONTROLLED. 16 mm., sound, in color. Running time 21% minutes. Released 1955.